Although today the villages of North and South Wheatley, about six miles north-east of Retford, are frequently considered to be a single settlement, historically the two were separated by a small stream and treated accordingly. The church of St Helen is an example of this, being specifically for South Wheatley, while its northern counterpart had its own church, dedicated to St Peter and St Paul. The date of the construction of St Helen’s is not clear, hindered further by the current ruined state of the church. However the surviving structure does include a Norman chancel arch – typical of the 12th century in rural architecture – which may be indicative of an origin at this time. This is backed up by a decree from the Archbishop of York, Geoffrey Plantagenet which dates to between 18 Aug 1191 and March 1205. This decree stated that part of the tithes of the rectory of South Wheatley were to be granted to the Canons of Southwell in order to provide lights perpetually for the Minster. This grant was later confirmed by Pope Innocent III in 1205 and later by the Archdeacon of Nottingham, Walter de Taney around 1240. It seems likely that the church was built at some point during the 12th century therefore, though earlier origins cannot, of course, be ruled out. 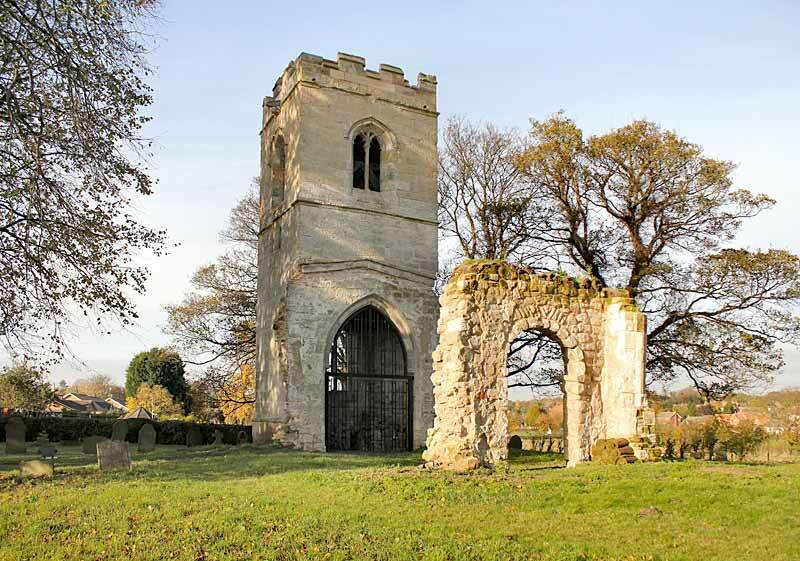 Certain records mention the church was originally a holding of de Busli and attached to the chapelry of Tickhill – this family held extensive lands across Nottinghamshire and nearby areas including Tickhill Castle but the family line died out in 1213. The church, if it was originally owned by this family, then passed into the patronage of the College of Canons at Southwell, who remained patrons for the rest of its lifespan. However, North Wheatley certainly was attached to the chapelry of Tickhill and early records seldom differentiate between North and South Wheatley. During the early-mid 13th century a grant by Richard, clerk of Muskham, was made to the rectory of St Helen’s church, South Wheatley, of all his lay fee in Norwell to furnish three candles for the mass of the Blessed Virgin Mary in Southwell. Between 1241 and 1249 Walter de Taney, archdeacon of Nottingham, confirmed that he and his successors would respect the terms of Richard's grant saving their rights over the parishioners who were not tenants of the church of South Wheatley. About the same time a note was issued by the Chapter of Southwell that the chaplain of South Wheatley was to supply one candle before the great cross for the daily mass of the Blessed Virgin Mary and additionally other candles for other services. The church was dedicated to St Helen, probably Saint Helena, the 4th century Empress of Rome who was the mother of Constantine the Great, although there is a Welsh saint by the same name. The church was a small building, with perhaps originally only a chancel and nave. The surviving tower was evidently built later, although it may have had a predecessor. A former north aisle was also noted in 1869 though this too may have been a later addition. The parish of South Wheatley was one of 28 parishes, and the smallest one at that, that formed the Peculiar of Southwell. This meant that, unlike most of the Archdeaconry, the parish was under the full control of the vicar-general of Southwell rather than the Archbishop of York, who only retained the right to confirm and ordain priests in the Peculiar. In the assessment of the clergy of the diocese of York for the poll tax granted to Edward III by the clergy of the northern province meeting in convocation on 15 April 1377 South Wheatley rectory is listed under the prebends of Southwell Minster. In November 1399, the Chapter of Southwell issued a certificate for an exchange of benefices between John [de] Palgrave, rector of South Wheately and John Doyle, vicar of Harworth. Palgrave was instituted to South Wheatley on the presentation of Richard Feld, warden of the free chapel of Tickhill and installed by the archdeacon of Nottingham. This adds support to the notion that South Wheatley retained a connection with the free chapelry of Tickhill, despite it's being under the patronage of Southwell Minster. Letters from the Chapter of Southwell dated 1413 relating to the results of an inquisition into the number and revenues of the chantries at Southwell carried out by the prior of Thurgarton and John de Crophill, canon, by order of Archbishop John Thoresby in March 1372/3, record that a chantry to the altar of St Mary was previously served by a chaplain from South Wheatley or his deputy, but following exile caused by the first pestilence [plague], was endowed by recent acquisitions made by William de Gunthorpe, canon, in Sutton and Carlton-on-Trent. The tower was added to St Helen’s probably around 1480, though an earlier date is possible, and was built in two stages. When the tower was completed a single bell was cast for it in Nottingham. At some later point, not known, two further bells were added to the church to create a peal of three. Around the same time one of the church’s rectors, John Hobson, left £2 in his will of 15 May 1483, to be used for the fabric of the church. Donations like this will have been especially important for a small rural church like St Helen’s, which lacked an important patron to help supply its needs and did not own many lands of its own to supply a large income. Exactly how rich, or poor, the church was in its early days is not certain. Pope Nicholas IV’s taxation of 1291 lists only one church in Wheatley but this was almost certainly North Wheatley given the mention of payments to Blyth. A similar tax issued in 1428 also only mentions one church, valued at the same 16 marks (£10 13s. 4d.) and so probably North Wheatley again. For South Wheatley church it is not until the 16th century that figures have survived. The Valor Ecclesiasticus, a comprehensive survey of the English church on the eve of the Anglican Reformation, listed South Wheatley. The church was listed as worth £6 14s. 2d. and was also mentioned as still paying 26s. 8d. a year to Southwell Minster to buy wax and oil for the lights. This was clearly a large portion of the church’s wealth it had to hand over each year and must have affected the church’s ability to maintain itself and to acquire furnishings and fittings. The church remained attached to the Canons of Southwell through the Reformation, except for a brief period when the Minster and College of Canons were closed down between 1541 and 1543. It was reopened however and remained the patrons of St Helen’s. The church was affected by other features of the Reformation however. In 1547 the Chantry Commissioners visited South Wheatley to survey it and its associated institutions and property. At South Wheatley they found that there were church lands let out to farm which brought in 18d. per annum; of this 12d. went to the parish poor while the remainder went to paying for lights for the church. The lands were all confiscated by the Commissioners in the King’s name. In 1559 the parson of South Wheatley was one of 50 Nottinghamshire priests who did not appear at a visitation of the Royal Commissioners who were checking for the acquiescence of the priests to the newly passed Act of Uniformity and Book of Common Prayer – Elizabeth I’s attempts to re-establish order to England’s church. These priests were declared contumacious (in contempt of authority). However, most of these priests likely later gave in and accepted the Act. Those who did not were probably stripped of office. The incumbents of various benefices including South Wheatley were exempt from the tenth payment of the four subsidies granted to James I by the clergy of both convocations in 1606, as well as the second payment of the single subsidy granted to the same king in 1610. This would have been because the church was still appropriated by Southwell Minster and was thus relieved of payment. In about 1635, in an anonymous list of defects in various churches in north Nottinghamshire the chancel of the church was reported as 'in decay', but no further details survive. During the 17th century England suffered from the Civil Wars between Royalists, Parliamentarians and other factions. After the fighting stopped the victorious Parliamentarians punished many supporters of the king. One such was Robert Tolson, the rector of South Wheatley, who in 1652 was stripped of all his estates for delinquency (a common excuse used by the Parliamentarians). This included the rectory of South Wheatley, which was subsequently claimed by a John Cartwright. However he was unable to demonstrate he had a lease to the church and so the Committee for Compounding, which was in charge of the affair, gave the rectory to a Gervase Hardstaff for £10. South Wheatley was hardly a grand prize, however. A few years later in 1676, a religious census recorded that the village had only 32 people old enough to take the sacrament. 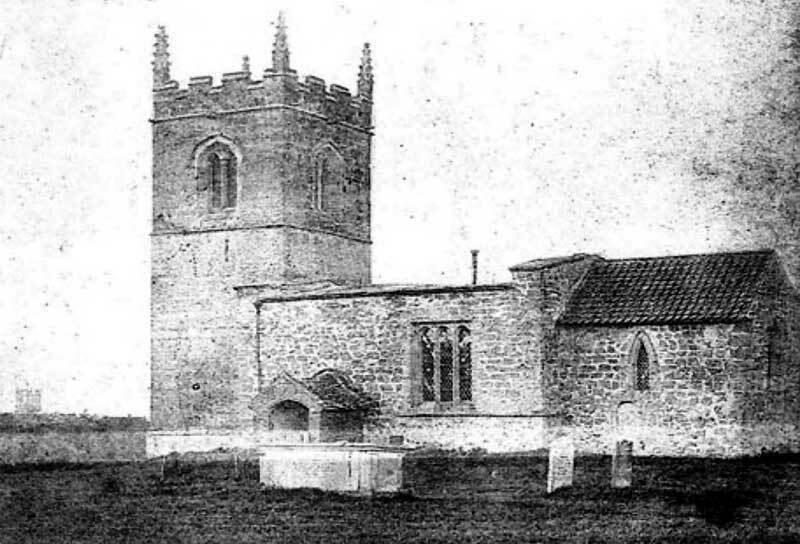 The small size of the village and the existence of North Wheatley’s church was clearly something being considered higher up the church hierarchy – a survey done in 1650 reported that South Wheatley parish was fit to be annexed to North Wheatley, although nothing came of the suggestion at that time. By 1743 the village had not grown, as a visitation report to the Archbishop of York made clear. There were just 12 families in the village, none of which were dissenters. The rector was Thomas Richardson, who was also the vicar of the prebend of Beckingham and the curate of Misterton. He resided at Beckingham, which must have been his primary office. The day to day running of South Wheatley was left to its curate, who was also the curate of North Wheatley and who was given the income from Misterton in return (presumably South Wheatley’s income was deemed insufficient). Services appear to have been held regularly however, although alternating with Beckingham. The Sacrament was given four times a year and around 10-14 of the 26 communicants in the village usually attended. Thomas Richardson was still in post in 1764 – he held the living from 1728 to 1775 – and reported that there were just eight families in the village. The arrangements for services were the same as in 1743, with just 7 or 8 of the 18 communicants in the parish attending. Throsby, writing in the late 18th century, commented simply of the Wheatleys: ‘churches in both, in which, nothing material’. By 1831 the village population was down to just 35 people. The church appears to have now been used as a supplemental source of income for senior officials as it was one of the many parishes held by Richard Barrow. The Reverend R. Barrow was one of the six Vicars Choral at Southwell – a prestigious post – and besides being Rector of South Wheatley he was also the rector of Barnoldby le Beck in Lincolnshire, perpetual curate of Halloughton and vicar of both Rampton and South Muskham. Unsurprisingly he did not usually perform services at South Wheatley himself, leaving that to his curate, the Reverend John Mickle. While many parish churches saw a revival in the 19th century as religious faith was rejuvenated during the Victorian era, South Wheatley continued to struggle. The village was too small to properly support the church, although its inhabitants clearly did their best. In 1840 efforts were made to put some new pews in the nave. In 1851 the curate James Willan reported that a typical congregation was 35 people – essentially, the entire village population. The church did not have a Sunday School of its own though. The few children growing up in the village attended one in North Wheatley. a small church, having nave (which once had a north aisle), Chancel, western tower and south porch. The nave has a lead roof, the Chancel is tiled. There is a Norman doorway, mutilated and masked by the porch; and a really fine Norman Chancel arch, late in the style, plain on its eastern face, but the western one has cylindrical and other mouldings and shafts set in nooks having good capitals. The roof is of flat pitch. The chancel has a single lancet and Priests door on the south. On the north of the chancel is a late square headed window of 2 light. The east window, of 2 lights, has a decorated character inclining to Perpendicular. On the south is a small piscina. The aisle must have been long ago open for in the north wall is a pointed doorway and one window of two lights without foliation. The font has circular cup-shaped bowl. The interior is neglected…. The church is in a lovely site and not much cared for. In 1873 the rector, the Reverend Thomas Henry Shepherd, passed away. His death was especially notable as he was also the prebend of Beckingham, the last prebendary remaining. His death therefore marked the end of the prebendal system and the Chapter of Southwell. The end of St Helen’s became almost inevitable towards the end of the 19th century. The Church of England was making much effort in this time to reorganise itself and adapt to the changing face of Britain prompted by the Industrial Revolution and the massive population growth it prompted. Many town and city parishes were created or split apart to create more. In the countryside smaller and poorer parishes were targeted and South Wheatley was both of these. A visitor in 1880 said that the church had become virtually disused except for funerals. The parish’s priests, as mentioned, were frequently rectors and vicars elsewhere as well, and for the last ten years of its existence it was attached to Bole parish. An Order in Council of 26 August 1881 directed that the advowson of Saundby, which was in the possession of the lords of the manor, was to be exchanged with South Wheatley, the patrons of which were the bishops of Manchester and Lincoln alternately. In 1883 the decision was made and both it and West Burton parish were joined to North Wheatley parish permanently. Soon after its priest, the Reverend T.C.B. Chamberlain, sought and obtained the permission of the Bishop of Lincoln to close and pull down both South Wheatley and West Burton churches, presumably because they were now unnecessary and a drain on the enlarged parish’s resources. St Helen’s was demolished in 1884-5. Its walls were pulled down by traction engines and the stone from it was used to repair walls and causeways around the village. All that was left standing, and that can still be seen today, was the tower itself and a part of the chancel including the original Norman arch. Many of the furnishings of the church were taken elsewhere. The altar went to North Wheatley, as did several of the traceried bench ends (which dated from 1510). The medieval font on the other hand went to the new church of St Catherine in Nottingham. The three bells in the tower remained there until 1896 when two of them were taken down and recast, then added to North Wheatley church. The remaining bell, cast by the Seliok family of Nottingham, was still there in 1958 when it was sold to Taylor's of Loughborough; it now hangs at Upper Broughton as the treble. However the timber bell frame still remains and in 2013 a steel cage was introduced to support it. The ruins of the church have continued to stand since then, steadily becoming overgrown with ivy and other plant life, which covered many of the smaller parts of the ruin entirely. The churchyard remained in use however, being used for burials by the inhabitants of North and South Wheatley. After more than a century of neglect, in 2013 a large project was undertaken to restore the ruins. The work was funded by English Heritage who gave £100,000, as well as a further donation of £37,500 from Nottinghamshire County Council’s Local Improvement Scheme. The overgrowth that had almost swallowed up the ruins was cleared away, leaving the old tower clearly visible, and the nearby trees were pruned back, improving its appearance for visitors. Structural work was also done to stabilise the ruins and make them safe for visitors. It is hoped that in the future the ruins could be used for the occasional party, such as for open-air weddings. In 2014 additional seating, some informational signs, and a memorial garden have all been added or are planned for the near future.